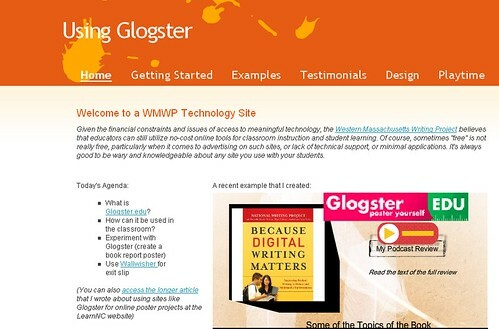 Yesterday morning, as part of our annual Best Practices event with Western Massachusetts Writing Project, I presented a session on using Glogster.edu in the classroom. I had about 25 people in the session and guess what? The technology worked! They all had computers to work on, the site was not blocked by the University, and they had plenty of time to play around with creating a project and reflecting on the use of Glogster in their classroom. Then, I set them up with accounts in my Glogster account, and let them have about 50 minutes (more than half the session) in playtime, which they all greatly appreciated. You can talk and talk about Glogster, but this is one tool that you have to experience to really begin to understand it. Looks like a cool workshop. Did you have any trouble with all the workshop participants hitting the site at once? I’ve run into problems recently where only one or two of my students can get into Glogster and the rest are shut out. If they wait long enough they can get in, but it seems to be locking people out if too many people hit the site at once from a single IP address.